The gold and yellow checked matt and gloss squares works really well, but it is a little mystifying why all the packets are the same color. Why woudn't they do each flavor in a different color bag? Bizarre. Our design team are happy to help if Bickel's would like to get in touch at the email address below! Apart from that, if taken individually, the packaging is really neat, tidy and noticeable. It should also say they are Ridged Chips, despite the picture making it obvious. These Chips were very crunchy. 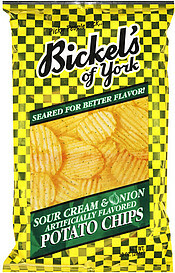 They were not thick, but as they were Rippled they may have been thicker than Bickel's regular Chips. The Ridged effect increased the level of crunchiness. As far as Ridged Chips go, these are wider and deeper than you may usually find. There were few broken Chips which suggests they are thick enough. There was a light green dusting of powder, that left a small amount of greasy residue on fingers. When the packet was opened a mild potato aroma was exuded. The flavor was somewhat more onion biased than sour creamy, but as sour cream is invariably the balancing addition, this is fairly common with this flavor.